Made by Baluchi women in Afghanistan, Islamic Republic of, Asia, 1890-1900. 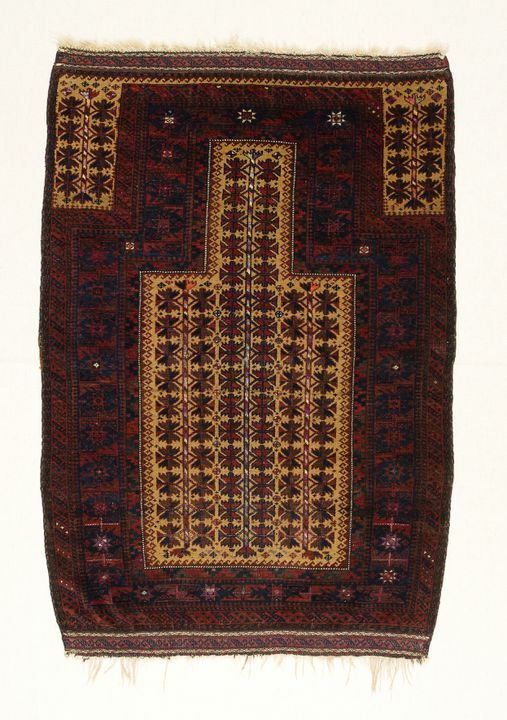 Large rectangular prayer rug with wool, camel hair and silk pile on a wool warp. The main design feature is the central prayer niche, or mihrab, which has a characteristic Baluchi tree of life design on a natural camel hair field. As is characteristic of Baluchi prayer rugs, three pattern bands in dark rich colours of madder red, aubergine and indigo blue outline the prayer niche. The inner band has a stepped triangle design, the middle band a sequence of guls (repeating geometric motif found in tribal weavings, in this example an eight pointed star within a flat octagon within a square), and the outer band a pattern of diagonal stripes. In this rug, the tree of life pattern consists of three trees bearing closely set serrated leaves. The design is repeated in the rectangular spandrels on either side of the prayer niche in the top left and right hand corners. The trunks of the trees are all highlighted with diagonal bands of brilliantly coloured silks. A narrow border frames the rug which has its original side cords with striped 'barber's pole binding and decorative flat weave end borders; these are intact and include bands of weft float brocade. The condition is excellent with about 160 knots per square inch on a wool foundation. Baluchi rugs are primarily recognisable for the combination of dark rich reds and blues, often in association with natural camel hair and small white accent motifs, as in this example. The stylised tree of life design in various forms is probably the most characteristic pattern used by Baluchi weavers. The use of silk in the trunks of the trees is a striking and rare design feature occasionally found in Baluchi rugs around the turn of the century. Some Baluchi rugs are influenced in their design by the neighbouring Turkmen tribal weavers. The gul, or motif, repeated around the middle band surrounding the prayer niche is of Turkmen type. This rug has been described as technically Timuri, rather than Baluchi, but the distinctions are very fine and a constant topic for debate among rug cognoscenti. The origins of the Baluch people are difficult to establish with certainty, and confusion persists over the ethnic origins of some of the smaller groups. The Baluch of Baluchistan in southern Pakistan are of Assyrian Arabic ethnic origin and are not known for their pile prayer rugs although they are known to weave flat-weaves, usually of a utilitarian nature; the northern Baluch, who do weave rugs, are all of Indo Aryan stock, speak a language related to Persian, and had settled in southern Iran (then Persia) by the 10th century. There they remained until the 18th century, when many were forced northwards during the reign of Nadir Shah (and subsequently), to the Meshed area of north east Iran. The remainder formed a loose confederacy called Baluchistan in what is now southern Pakistan. The principal Baluchi weaving area straddles the northern Iran/Afghanistan border. Baluchi rug weaving was carried out by women and girls who produced items for their own use, mainly in the period of time between betrothal and marriage. This rug would have been made on a horizontal loom pegged out on the ground. Like the Turkmen, they generally wove small scale rugs and bags suitable for use in nomadic desert living. The wool is characteristically very fine and lustrous, as in this example. The pile of this rug, like most Baluchi rugs, is knotted with the asymmetrical or Persian knot. The production date was assigned by the vendor on the basis of the use of synthetically dyed silks, in particular the bright orange used at the top of trees in the side spandrels, which became available to Baluchi weavers about 1900. There are no known examples of Baluchi rugs of this quality which can be dated earlier than the mid 19th century. The earliest images of prayer rugs date to the 14th century, and obviously postdate their use; documentary evidence for prayer rugs dates them to at least the 11th century. Prayer rugs are used for the purpose of prayer throughout the Islamic world, both inside and outside the mosque; they are always placed on the ground with the top of the mihrab (prayer niche) pointing towards Mecca. Small prayer rugs are common in nomadic societies as they can be easily transported and readily available for use at prayer time. Purchased by the vendor, Cito Cessna, in Kabul, Afghanistan, in July 1977 and remained in his possession until acquired by the museum with assistance from the Oriental Rug Society of NSW, Inc..